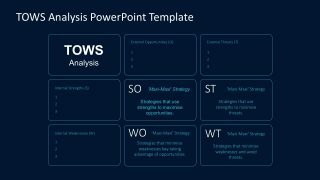 TOWS Analysis PowerPoint Template is a managerial tool for evaluating business strategic options. 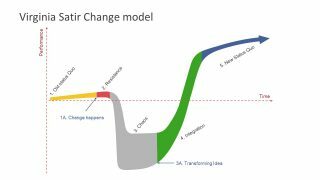 It is a huge challenge for managers to make decisions. 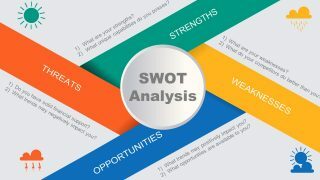 Therefore, in order to make complex strategic decisions, they use various tools and techniques like the SWOT and TOWS analysis. 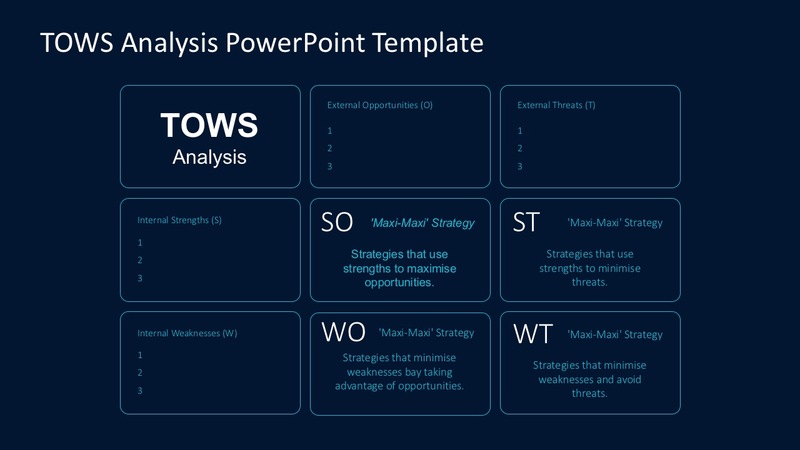 TOWS analysis is similar to SWOT analysis. 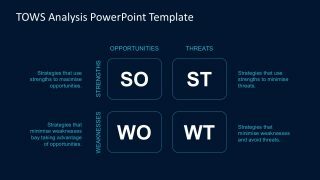 These techniques have the same process listings: Strengths, Weaknesses, Opportunities, and Threats. 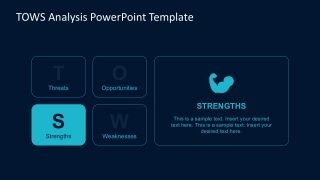 Both are effective in analyzing both macro and micro factors of a business external and internal environment. 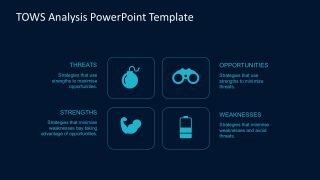 Rather TOWS analysis examines the opportunities and threats first, before analyzing the weaknesses and strengths. 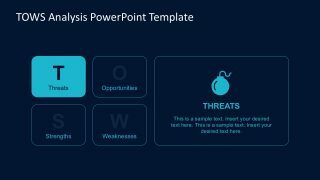 Then, after analyzing all the factors related to threats, opportunities, weaknesses and strengths, managers can make plans for the company. 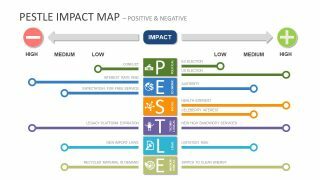 It allows businesses to take advantage of the opportunities and strengths by minimizing the negative impact of the weaknesses and threats. 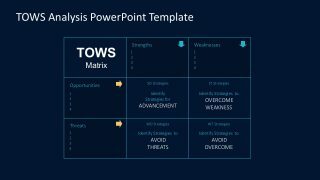 TOWS Matrix is a relatively simple tool for generating strategic options. 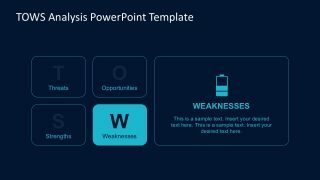 The slides use icons, charts, and diagrams to establish an understandable approach. 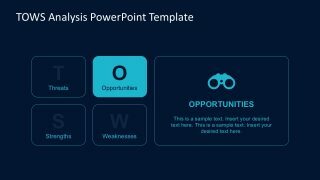 The layout is in blue theme for a professional look. 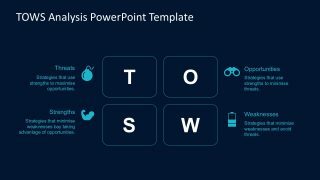 Moreso, the texts are very easy to replace, and all the shapes are fully editable. 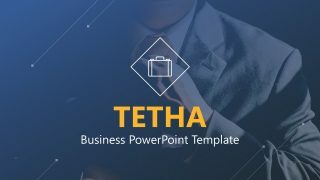 The PowerPoint template is available in 16:9 widescreen and 4:3 standard layout. Also, see more business matrixes, models, and diagrams.